Enjoy an authentic cultural experience of southern Spain on an enriching full-day excursion to Jerez and Cadiz from central Malaga and Costa del Sol. Accompanied by an expert guide, pleasure your palate with a tasting session at an established winery and watch an exhilarating equestrian show typical of the region. Admire breathtaking panoramas of the Andalusian countryside; cruise along Cadiz’s curvaceous coastline by ferry; and conclude your cultural day with a guided tour of the city’s historical heart. Greet your knowledgeable guide in central Malaga or Costa del Sol and climb aboard a comfortable, air-conditioned coach to Jerez de La Frontera. Follow the renowned Ruta del Toro (Bull Route) and admire the agricultural beauty of the region as you pass cattle farms and farming terraces. On arrival, enrich your knowledge of complex winemaking processes during a tour of Williams and Humbert winery. Enjoy interesting demonstrations and discover fascinating facts as an expert winemaker guides you through the winery. Your tour culminates with a tantalizing tasting session in which three types of wine are available for sampling. Next, feel your adrenaline levels surge as you watch a exhilarating Andalusian equestrian show in which masterful horse trainers interact with powerful Adalusian horses. Return to the coach and listen to local legends and entertaining anecdotes as you travel towards Puerto de Sants María. On arrival, embark an awaiting ferry and set off on a smooth sail along the blissful beaches and pristine bays of Cadiz. When your ship docks, disembark and explore the historical highlights and impressive monuments of the city. Visit the renowned Puertas de Tierra monument and admire the Baroque beauty of Cadiz Cathedral. Sample some of the city’s seafood specialities in a rustic restaurant (own expense) then reunite with your guide for a panoramic sightseeing coach tour of the city. After the coach tour, rest and revitalize during the journey back to the Costa del Sol. 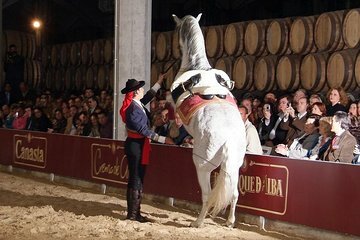 We really enjoyed the winery and horse show in Jerez. Rain and strong winds were a problem in Cadiz so the boat trip was cancelled but we would highly recommend climbing the cathedral tower for the view of the city. This tour was excellent. I recommend it to everybody. A full coach which meant that along with other visiting groups to the winery, the guide could not be heard. No mic system or person P/A system which you get in cathedrals would have been better. Apart from that, a great trip, especially the ferry trip across the bay. I wish we had more time in Cadiz, so would have been happy to miss the Andalusian horse display. A wonderful day, not rushed and the guide was extremely knowledgable - thank you! Excellent trip which was well planned interesting and ran smoothly. Tour guide and bus driver were really nice guys. Enjoyed by whole family.Our tour party was only 30 so plenty of room on coach and not many pick ups. Good value trip. Brilliant day sight seeing learning about the wines and how they are made. Beautiful horses too. Would not recommend due to the amount of time on the coach which could be improved by one pick up point in each place rather than individual pick up points within each resort on the route - with Malaga being the worst as furthest away and no individual pick up points from Malaga. Unfortunately the weather was bad so we were unable to take the cruise, no compensation was made for this, perhaps the Cathedral tour charge could have been included instead. At the horse show my seat was directly behind a wide pole and I was unable to see a great deal of the show very disappointing! I was not the only one behind poles in the arena. The panoramic city tour took us quickly through the city without any stops for photos. People on the right side of the bus missed so much. The quide was very informative, the driver was excellent. We have taken many viator tours in Spain that were very good so were disappointed in the quality of this tour.